My name is Nicole and I really like dancing! If you were to ask anyone who knows me to tell you one thing about me they would tell you that I just really like dancing. I started dancing at the age of 2 and haven’t stopped since. (I am almost 26 now!) I danced competitively in high school, I danced in college, and now I have my own dance company that I run with a close dancing friend. To put it shortly, dance is my life. So the moment I was in too much pain to keep dancing, my life was turned upside down. I lost a part of my identity. But this is a happy story, I promise! So bear with me here. I want to explain to you all why you should never ever give up. It was May 2016 when my hip pain started. I woke up one morning after an intense workout and I couldn’t lift my left leg. I didn’t have health insurance in the Boston area because I was only 23 and still on my Dad’s health plan and he only had coverage in Buffalo. So after a few weeks of pain, I decided I to fly to Buffalo and get my hip checked out. I had a consult with a hip doctor there and a MRI before coming back to Boston. After a few weeks, the doctor from Buffalo called to tell me that the MRI was normal but I had some strange blood work, so he couldn’t do anything for me until I saw a rheumatologist… Now I couldn’t afford to keep flying back and forth to Buffalo so I had to find a new job in Boston. I needed my own health insurance. It took a few months but I finally got a new job and once the health insurance kicked in I started seeing doctors in the Boston area. I saw 10 different specialists (in both rheumatology and orthopedics) before finally being referred to a physical therapist who actually believed me and the amount of pain I was in. The problem was that I was a dancer, and “normal” people do not put their bodies through the extreme ranges of motion that dancers do. So every doctor I saw was convinced that nothing was wrong because I could touch my toes. After going to physical therapy for a few months, (Girl Fit didn’t even exist at this point in time yet!) my physical therapist suggested I visit the Dance Medicine section at Boston Children’s Hospital. It was there that I met Dr. Stracciolini. She knew what dancers do and she believed me. She could see how much I had gone through and she knew that dancers never fully expresses how much pain they are in. She ordered a new MRI to be done. The new MRI showed a ganglion cyst and possible labral tear. But the worst part was, the radiologist compared the new MRI to the CD of the old one from Buffalo, and the findings were “consistent”... meaning that the radiologist in Buffalo mis-read the MRI!! I wasn’t crazy. There was something wrong with my hip. It was around this time that my new health insurance decided that I should be better and that they weren’t going to cover any more PT visits. So, Dr. Stracciolini suggested this new little PT practice that opened up in Newton that had reasonable self-pay options. And that was when I came to Girl Fit and met Kate :). 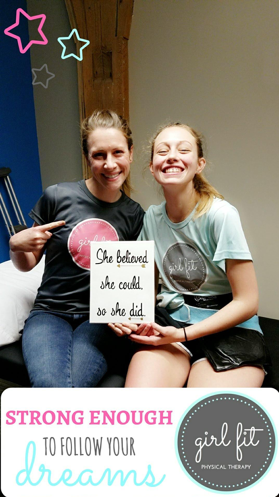 I was going through various rounds of diagnostic cortisone injections and Kate and the Girl Fit crew helped me continue to get stronger. Things were finally looking up, but unfortunately the pain was not getting any better. So it was around June 2017 that Dr. Stracciolini ordered a new set of x-rays and a new MRI with contrast. They found that I had hip dysplasia and a labral detachment tear. These diagnoses were what my insurance needed in order to cover more physical therapy visits. Then, Dr. Stracciolini referred me to Dr. Yen (the hip scope surgeon at Boston Children’s) and I continued doing PT with Kate. On August 1st, 2017 I was rushed to the ER from work for what we found out to be a kidney stone. It turned out that I was going to need surgery to get the stone removed. I was not expecting that one… So we waited a week to see if the stone would pass on its own (it didn’t) and I went into surgery. When I came out, the doctor did not have the good news that I was hoping for. They weren’t able to get the stone because my ureter was too small for their surgical equipment. They had to put a stent in to stretch out my ureter and they were going to have to leave it in for two weeks before going back for ANOTHER surgery!! My consult with Dr. Yen AND my dance company’s show were that week! I was going to be in surgery two days before putting on my first ever professional production. I was terrified. The day before the second kidney surgery, I met with Dr. Yen. When he walked in the room, I knew something was not right. He looked at me and said “I can’t do the scope on you, you’re going to need a PAO.” I immediately started crying. A PAO was not a small surgery. The scope surgery would have been a 6 week recovery with some PT and I knew I would have bounced back in no time. But the PAO (Periacetabular Osteotomy) had a much much longer recovery time... But I wanted nothing more than to dance again, so I agreed to meet with the next surgeon. I met with Dr. Matheney on the morning of Friday August 25th, 2017. It was opening night of our show and I had to be at a tech rehearsal in a few hours. But Dr. Matheney was amazing. He explained the procedure to me and reassured me that the end was in sight. They were going to cut my pelvis in three places so that the acetabulum (the socket of the hip joint) could be rotated around the femoral head (the ball). My hip had basically been coming out of the socket by 1 cm for the past year. That was why I was in so much pain! And that was why it hurt to dance! In order to get the PAO done and recover enough to be able to go to class on crutches in January, I had to push up my December finals by 2 weeks. (Anyone who knows anything about architecture master programs knows that this is NOT an easy feat.) I spent my entire thanksgiving break doing homework at my desk in my apartment all alone. My super awesome friend Lisa did came over with a few study snacks and study breaks, but for the most part all I did was homework. 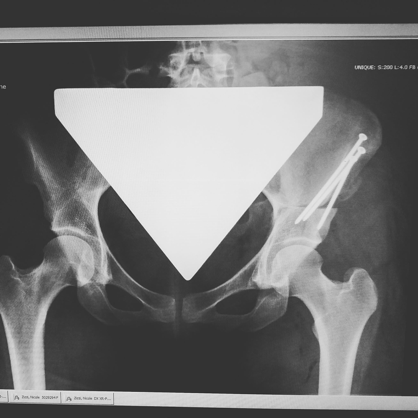 Then the day finally came and it was time for me to get a new hip! I was terrified but incredibly excited at the same time. 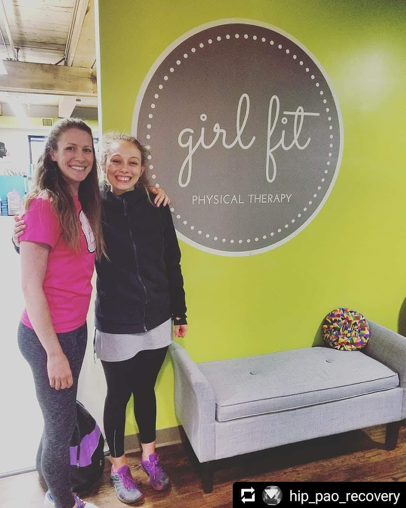 One month following the surgery, I was back at Girl Fit and this time we were actually building strength instead of just maintaining. I was SO ready to get back to the dance floor. I also started to see Kelsey Griffith through The Micheli Center. She helped me A LOT with all the mental challenges that came with the PAO. She even visited me while I was still recovering in the hospital! PT was not easy. There were days where I would end up crying on the floor in my room at home, but I was making more progress over the course of 1 week than I previously had over the course of 1 year. I was doing my exercises everyday while trying to keep up with all my graduate school coursework. I was exhausted. But everytime I came into Girl Fit, I couldn't help but smile. Everyone in there was always happy to see me. They always asked about school and they always made me laugh. Anytime Kate was out of the office, Christina would treat me and she always made me feel so confident with her positive comments on my progress. Once my range of motion restrictions were lifted, I started taking mindful movement classes with Jen and I always felt so grounded, centered, and strong. I cried after my first mindful movement class with her because I surprised myself so much with how strong I had become. They were tears of joy and relief. It finally felt like my body was my own again and that I had control over it. My hip journey has taught me a lot about life. First, it taught me to never doubt myself. I am the owner of my body, and I know it best. Never let someone tell you what you are or are not feeling. You know yourself the best. Second, it taught me that the people who you surround yourself with are incredibly important. I built myself a team of incredible, strong-willed, and inspiring women who believed in me from day 1. I can honestly say that I would not be where I am today if it were not for the wonderful support team that I have: my dance partner and best friend Lisa, Kelsey from the Michali center, the Girl Fit team, and most importantly Kate. They are all incredibly knowledgeable at what they do and most importantly, they are always positive and smiling. Finally, I learned that no matter what you are going through, you should never ever give up. You are ALWAYS strong enough to follow your dreams. It has been a long two years, but I am finally dancing again! I have Persevered And Overcome many obstacles on my way to healthier hips.And I owe a lot of that to Girl Fit. I am so happy and incredibly proud to be a girl fit girl. Thanks to Nicole for contributing to our blog!! We are super proud of her!